This product requires the base game Galactic Civilizations III. Experience the early days of the Terran Alliance and lead humanity's first steps out into the galaxy. Destiny might be calling, but you are not alone and will soon discover that not every race is welcoming. Your choices will guide your people's future as you face down new and unexpected threats, build your empire, and explore the furthest corners of space. 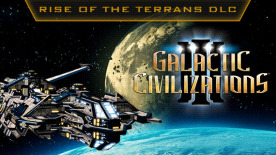 Galactic Civilization III is required to play this DLC.